Coriander is one of many spices that are available throughout the year providing a fragrant flavour that is reminiscent of both citrus peel and sage. The fruit of the coriander plant contains two seeds which, when dried, are the portions used as the dried spice. When ripe, the seeds are yellowish-brown in colour. Coriander seeds are available whole or in ground powder form. Coriander is considered both an herb and a spice since both its rich green leaves and its seeds are used as a seasoning condiment. Fresh coriander leaves are more commonly known as cilantro and bear a strong resemblance to Italian flat leaf parsley. Coriander seeds have a health-supporting reputation that is high on the list of the healing spices. In parts of Europe, coriander has traditionally been referred to as an “anti-diabetic” plant. In parts of India, it has traditionally been used for its anti-inflammatory properties. In the United States, coriander has recently been studied for its cholesterol-lowering effects. Coriander is also a good source of iron, magnesium and manganese. Fresh coriander (or cilantro) leaves should look vibrantly fresh and be deep green in colour. They should be firm, crisp and free from yellow or brown spots. Coriander is highly perishable and it should always be stored in the refrigerator. If possible, it should be stored with its roots still attached by placing the roots in a glass of water and covering the leaves with a loosely fitting plastic bag. If the roots have been removed, wrap the coriander leaves in a damp cloth or paper towel and place them in a plastic bag. Fresh coriander usually lasts up to four days. 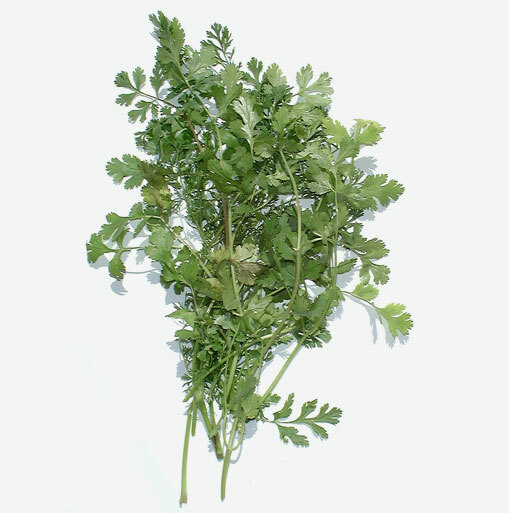 Fresh coriander (cilantro) should be washed right before using since it is highly fragile. The best way to clean coriander is just like you would spinach by placing it in a bowl of cold water and swishing it around with your hands. This will allow any sand or dirt to dislodge. Remove the leaves from the water, empty the bowl, refill it with clean water, and repeat this process until there is no dirt remaining in the water. Coriander can be served in many ways. In a saucepan over low heat, combine vanilla soymilk, honey, coriander and cinnamon for a delicious beverage. Sauté spinach, fresh garlic and coriander seeds, mix in garbanzo beans, and season with ginger and cumin. Add fresh chopped coriander to soups and broths.